"This is a drink that I came up with mixing stuff up one night and it has been a best seller at the bar I work at for a long time." 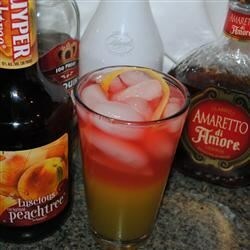 Fill a pint glass with ice, and pour in the vodka, amaretto, peach schnapps, coconut rum, and melon liqueur; stir. Pour in the orange juice and pineapple juice. Float the cranberry juice on top. Garnish with a lemon twist. Very tasty, great for the Summer season.